Two House Democrats, Alexandria Ocasio-Cortez of New York and Ayanna Pressley of Massachusetts, joined the crowd of demonstrators Tuesday in front of the White House. 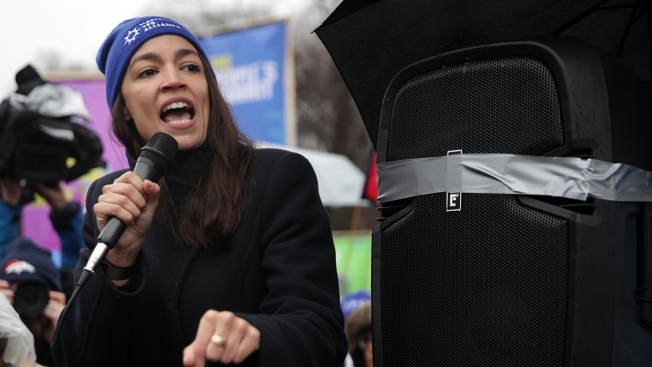 U.S. Rep. Alexandria Ocasio-Cortez speaks during a rally in front of the White House February 12, 2019 in Washington, DC. Activists called on Congress to put permanent protections on Temporary Protected Status (TPS) holders. Perla Canales, born in Honduras, has been living and working in the U.S. for 26 years under a federal program that temporarily protects her immigration status, but she is worried how long that will last. Canales, 54, who works as a cleaner at a mall in Staten Island, New York, was one of thousands who went to Washington on Tuesday to call on Congress to enact permanent protections for those in the TPS program. Approximately 325,000 people have Temporary Protected Status, which is granted to immigrants from certain countries fleeing natural disasters and civil wars, and allows them to live and work in the United States. Though previous administrations have always renewed TPS protections, the Trump administration has tried to end the program for most of its recipients, including 200,000 Salvadorans, nearly 3,000 Nicaraguans, 57,000 Hondurans, 46,000 Haitians and nearly 10,000 from Nepal and Sudan.